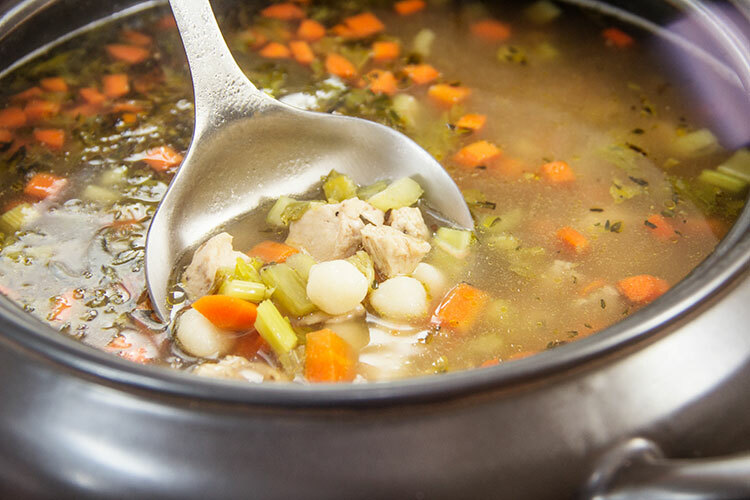 This chicken dumpling soup is easy to make in your crock pot. The lemon-egg mixture in this recipe makes this healthy soup extra rich, creamy and flavorful! Does anyone else have that desperate searching thing start up in late March? Where you look for any sign – any glimpse of potential – that spring might be soon approaching? A patch of green grass. A sun that’s strong enough to warm your face. A weather forecast that has at least a “5” as the first digit. I just returned from a long walk with Calvin. And sorry to say, there weren’t any glimpses yet. Just me bundled in a hat and mittens and a winter coat to fend off a sleet/snow mixture and a bitterly cold wind. 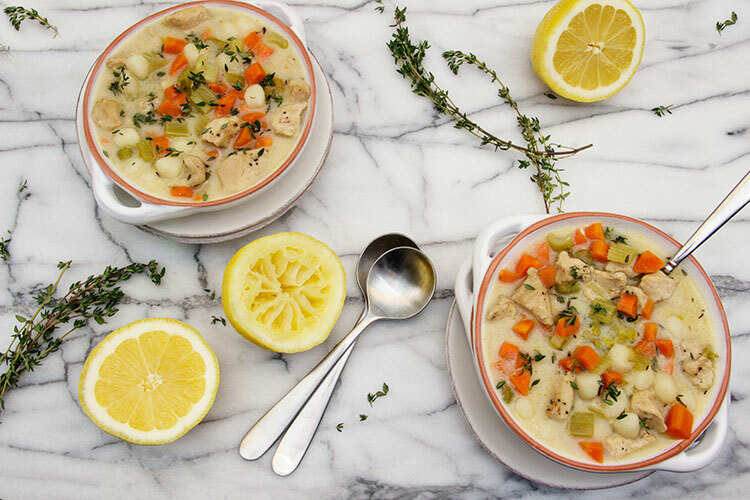 Let me tell you, lemon chicken dumpling soup is the perfect remedy for any cold and dreary day! This soup’s full of healthy veggies and seems so nourishing to both body and soul. It’s also piping hot and full of tender chicken and delicious dumplings and very comforting. I added thyme and a lemon-egg mixture to make this version extra rich, creamy, and full of flavor. One thing I’ve learned: add the lemon-egg mixture very carefully. After the soup is cooked and you’ve turned off the slow cooker, stir the mixture slowly into the soup. Otherwise the boiling broth will basically scramble the eggs. 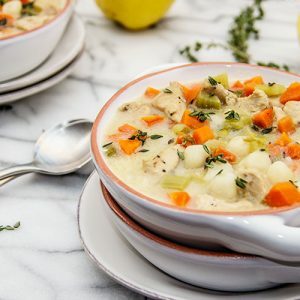 To make this soup easy for any day of the week, I use packaged potato gnocchi. You can find potato gnocchi in the grocery alongside all of the other dried pastas. It’s also sometimes available fresh in the refrigerated section with the fresh pastas. 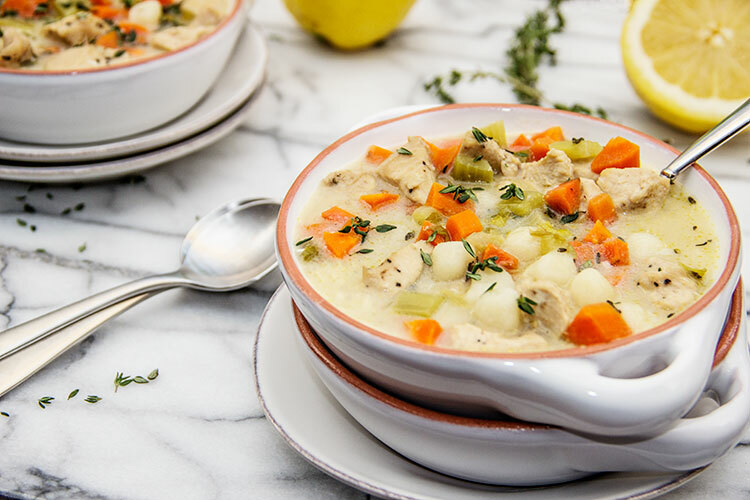 Lemon chicken and potato dumpling soup will comfort me through it all! Add the olive oil, chicken, and bay leaves to a slow cooker set to Low heat. Season with salt and pepper and stir until well combined. Cover and cook, stirring occasionally, until chicken is cooked through, about 1½ hours. Add the onion, carrots, celery, and thyme to the slow cooker, still set to Low heat. Season with salt and pepper and stir until well combined. Cover and cook, stirring occasionally, until veggies are softened, about 2½ hours. 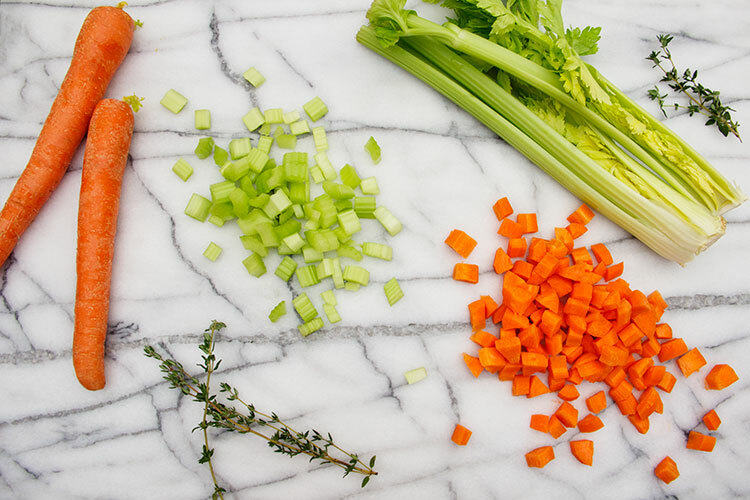 Measure 1 cup of vegetable broth and set aside for later. Set the slow cooker to High heat and add all of the remaining vegetable broth and gnocchi. Stir until well combined. Cover and cook, stirring occasionally, until gnocchi is soft and al dente, about 1 hour. Turn off the heat on the slow cooker. 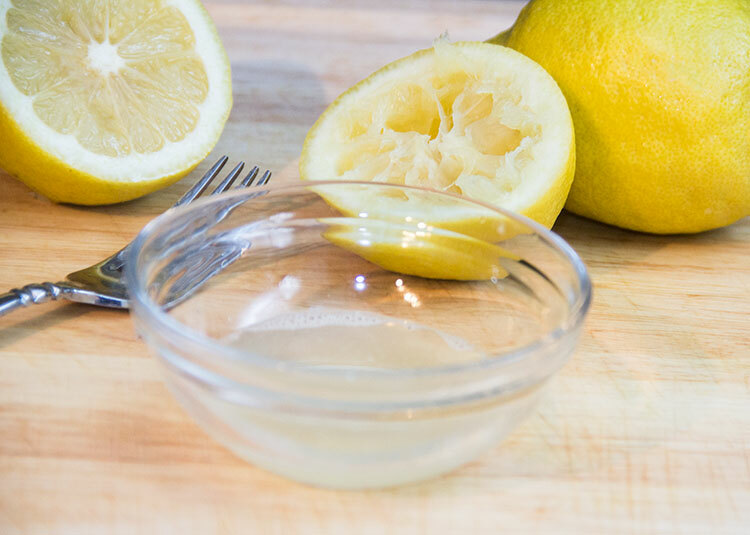 Squeeze all of the juice from the lemon into a large mixing bowl. Add the two eggs to the mixing bowl, and stir until well combined. Pour the reserved 1 cup of vegetable broth into a microwave safe container and heat in the microwave until hot but not boiling, about 1½ minutes. Slowly add the hot 1 cup of broth to the lemon-egg mixture, whisking continually as you pour. Slowly add the hot lemon-egg-broth mixture to the slow cooker, continually mixing the soup with a spoon as you pour. Season the soup to your taste with salt and pepper. Serve. I estimate nutrition info by entering my recipes at Calorie Count. Check out more tasty slow cooker recipes. Check out more delicious soup recipes.